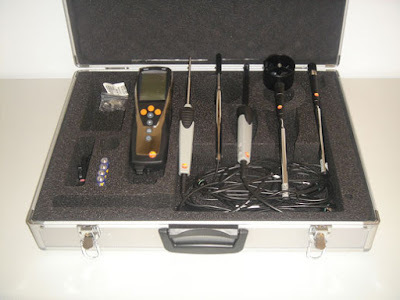 The measuring instrument for ambient air conditions, for assessing Indoor Air Quality and adjusting and inspecting VAC systems. testo 435-1 is an affordable introduction to measurement engineering for ambient air conditions. The new IAQ probe measures Indoor Air Quality by measuring CO2 level, air moisture and air temperature. Temperature and humidity measurement is integrated in the new thermal probe. In addition, it is also possible to connect additional temperature probes.